This is an audience recording! But apart from some very brief moments when someone is close to the mic (especially at the beginning), you can barely tell. Its a great performance, very raw and exciting. This one has been subject to some judicious EQ, level balancing and noise reduction and has polished up really well. Original singer John Foxx left after they began 1979 with no record company, after being dropped, and after a short tour of the USA (there’s a remastered gig from Philadelphia on that tour on the Live and Loud! Archive already HERE). It seemed Ultravox were finished until keyboard player Billy Currie, who had been working with Midge Ure in Visage, persuaded him that Ure should become Ultravox’s new singer (it may actually have been Ure persuading Currie!). 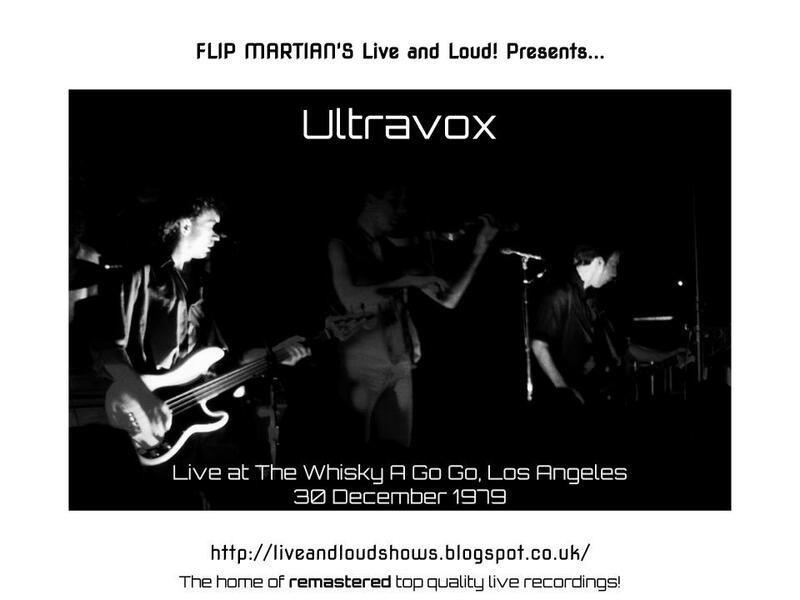 Without a record deal, Ultravox reconvened, wrote some songs and arranged to play some live dates in America in November and December 1979 - and we have a recording of the last show from that tour for you this time. It’s not quite the full set - Hiroshima Mon Amour and, I think, King's Lead Hat are missing, sadly - but what IS there, from set opener Astradyne to set closer I Can't Stay Long, is a great record of a band enjoying themselves and gelling - they went on to sign a record deal in early 1980 and included many of the new songs played at this gig on their first album as a quartet, Vienna. The set also features a few tracks from the last album with John Foxx (Systems of Romance) as well as an early version of a song which didn’t make it onto record at all (at least, not as a studio recording). There are more Ultravox shows to come, so be sure to come back! In the meantime, this show is now available for free download HERE as 1 MP3 file. Or, if you would like to have separate tagged MP3s, or even lossless files in FLAC format, head on over to the Donations tab to see how you can obtain these for a very small donation towards the site costs. Fantastic gig.....any more Ultravox with Midge? There certainly will be! At least 1 more in the next few months. Great show. It's really interesting to hear the Foxx material with Ure singing. I do prefer the Foxx versions but it was fun to hear it. I'm also really surprised at how complete the Vienna songs are. I would have thought they'd have a lot more differences at that point. "A version of "Sound On Sound" appears on the b-side of "Passing Strangers" but it's retitled as "Face To Face". Indeed it was. SOS was definitely the early version of FTF.